It’s almost that time of year again – the frost-covered windshields, two layers of socks and stew in slow cookers time of year. There’s nothing like winter’s chill to remind us of the simple pleasure of jumping under cozy covers each night. Did you know some of Iowa’s farmland is staying under the covers this winter, too? Farmers use cover crops — cereal rye, winter wheat, peas, radishes and clover — to keep a cover on farmland between harvest and planting seasons. Grown in between rows of soybeans and corn, these small plants have big benefits for soil fertility and conservation. 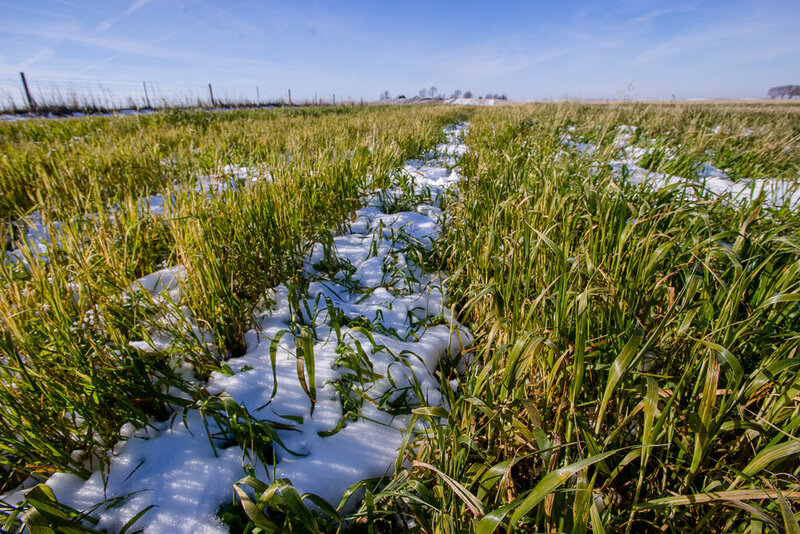 Farmers ultimately decide if cover crops are the right fit for their land management practices, taking into careful consideration the costs and benefits for their operation. Over the last few years, a growing number of Iowa farmers increased their use of cover crops. According to Iowa State University Extension and Outreach, the number of cover crop acres planted grew by 22 percent from 2016-17. We recently reached out to Rob Stout, a soybean, corn and pig farmer from southeast Iowa, for his perspective on cover crops. Stout has farmed for more than 40 years, and his family has farmed for four generations in southeast Iowa and eight generations in the U.S.
Iowa Food & Family Project (Iowa FFP): Why do you use cover crops? Stout: Cover crops are an extra layer of protection for the soil. I started planting cover crops in 2009 to help reduce erosion, but since then I’ve found a lot of extra benefits in soil and water quality. Iowa FFP: How have cover crops supported soil and water quality on your farm? Stout: Soil is a living organism. Cover crops add microbial benefits and help the soil breathe. Growing soybeans and corn for a few months adds some microbes to the fields, but 11 months of cover crops helps build organic matter and improves the nutrients in the soil. Additionally, the roots help keep soil in place and out of waterways. I believe it’s important I’m doing my part to protect water quality for future generations. I encourage other farmers to consider implementing or increasing the use of cover crops on their farmland. Iowa FFP: What cover crops do you use? Stout: My go-to is cereal rye, which is ironically the first cover crop I used. Then I started adding cover crops, including peas, radishes, crimson clover and winter wheat. This year, there’s a shortage of cereal rye seed due to the growing conditions in North Dakota, so I’m using winter wheat for the first time. Iowa FFP: How do you decide which cover crops to plant? Stout: You can’t make every decision on your own, so I rely on what’s worked for other farmers. I talk to my neighbors and do a lot of research. I try different mixes and see how it works for my soil health. I rely on different publications and read up on research from the Iowa Soybean Association and Iowa State University Extension. Cereal rye stays alive over winter, much like the grass on your lawn. In the spring, it greens up early and creates a lot of ground cover. On my farm, it’s the number one crop I’ve used for protection against soil erosion. Iowa FFP: How big of a financial commitment are cover crops? Stout: When commodity prices go down, as they have in the last three to four years, it’s hard for farmers to justify excess spending on new technologies. Cover crops can be expensive. In general, a mix of cover crop seed can cost between $11 and $15 per acre. Sometimes extra equipment is required, too. I have a drill that I bought specifically to plant cover crops. It is also a big time investment. I’m lucky my son likes to help me plant, but in the past I’ve paid for an airplane to spread the seeds, which was $17 an acre. For folks who have hundreds or even thousands of acres, that adds up quickly. Net farm income has decreased by nearly 50 percent since 2013 — yet the increase in cover crop acres shows environmental stewardship remains a priority for Iowa farmers. Editor’s Note: Interested in learning more about cover crops? You can find more information on the following websites: The Midwest Cover Crops Council, Practical Farmers of Iowa and Sustainable Agriculture Research and Education. Please note, by clicking the links you will be leaving a partially funded checkoff site.